This is the FINAL version of "The Betty" paintball prop! Let me introduce to you V4.0. It now comes with a high quality numeric matrix keypad, with lots of holes for easy mounting! The Betty is a wonderful little prop that talks to you. Many people were asking for an external keypad that was not PCB based. 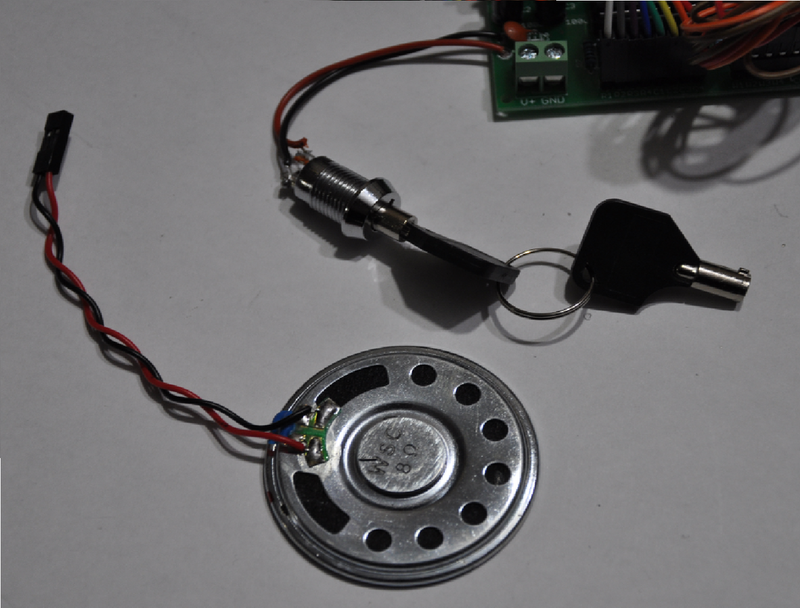 The betty 3.2 was very successful, but many people were wary of the keypad, as it had exposed components. We have fixed that! We have also added a power key. The included key module is connected to the power input of the Betty processor board. This electronic power key module has a mounting nut, and acts to enable/dusable power using one of two included keys. We have improved the countdown timer hardware, and we've also optimized software functionality. 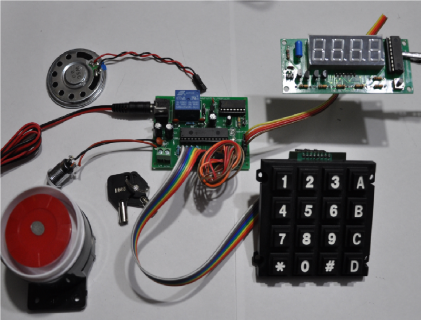 It features a four digit combination lock function/deactivation mode. There is a wire-cut mode as well! 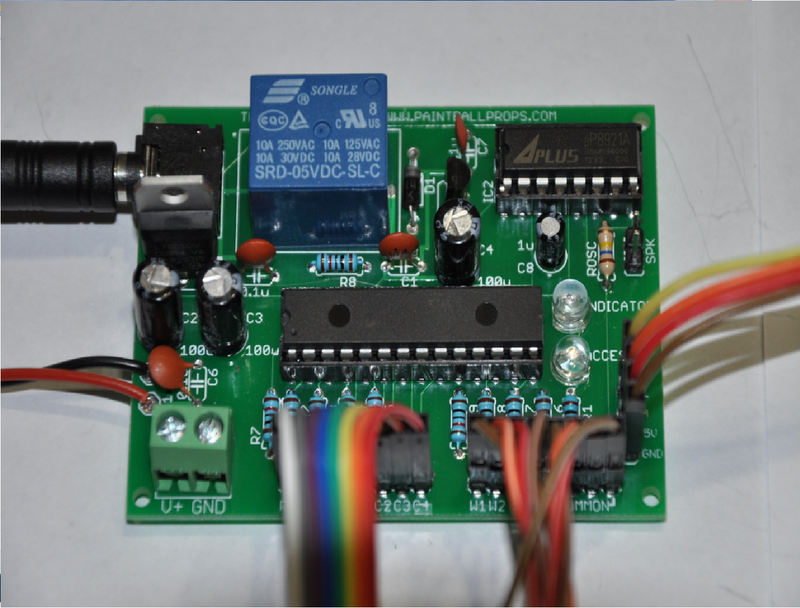 You can program in one of four wires as the deactivation wire. Per game, of course. These wires are female-female wire connectors that plug directly into the board. You can simply remove a wire during the game (for the sake of recycling), or you can cut them, and replace the wire when the game is over. This set is extremely easy to use, and ready to be mounted as soon as you receive it! We have carried over all of the functionality that the Betty 3.2 provided. The Betty 3.2 & Betty 4.0 both have a software routine that tells you if all of the wire-cut wires are not connected properly. During power up, if all four of the wire-cut wires are not connected properly, the red indicator LED will turn on and stay on until you have them all connected properly. This will save a ton of time later on! A full demonstration can be found in the above video! This version has a default disarm code of Star (*), Number (#), 1, 1. You can also easily enter program mode during the power on sequence so that you can program in your own special code for that specific game. The only way to disarm the Betty once it is running is to either cut/remove the correct disarm wire, or to enter in the correct combination. Entering an incorrect combination, shaking the Betty, or cutting one of the incorrect wires will act to trigger a FAST countdown mode where the countdown timer counts down 10x times as fast. Just like in the movies!. If you cut the wrong wire, then cut the deactivation wire, it will have no effect. If you cut the incorrect wire, then the only way to disarm is to enter in the correct sequential 4-digit combination. If any of the three tamper modes are triggered (Incorrect Combo/Incorrect Wire Cut/Prop Vibration), then the countdown timer will immediately start counting down 10x times as fast. From there, the only way to disarm the system will be to enter in the correct combination. 2) A solid 9-12v power supply is required (Not included). If the voltage at the input drops below 7v, the device memory will not function correctly. The device will misbehave if the supply voltage falls below 7v. Your power source should be able to support 1A or higher. When in standby mode, the Betty requires only a few milliamps to operate. When the siren goes off, it requires up to 700mA of current. Three to five 9v batteries in parallel (NOT SERIES) will work just fine. 5x 9v batteries in parallel will work even better. 5-6x D-Cell 1.5v batteries in series will work well too. Optimal is 11.1v LIPO or Lead Acid. Do not use dollar store batteries! 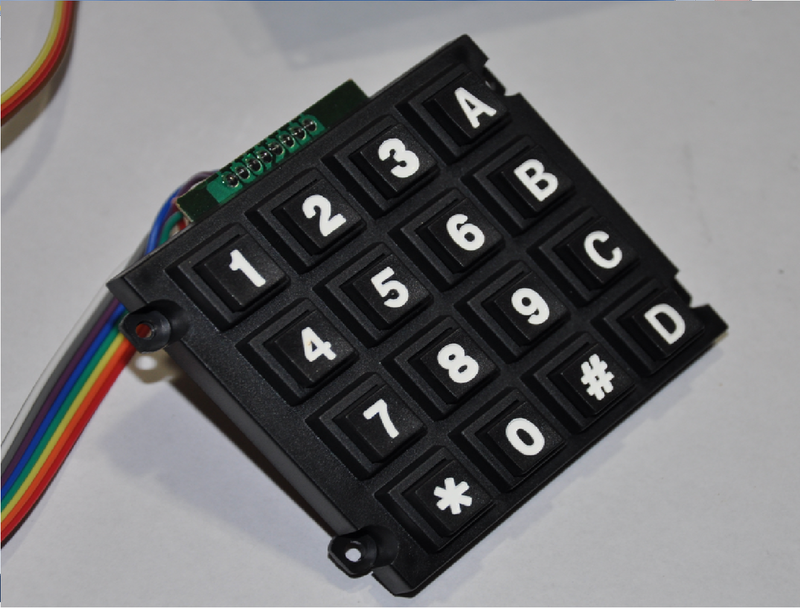 1x Black 16-Digit Matrix Keypad (Tested & Connected To The Main Betty Board) - YOU CAN ALSO INQUIRE ABOUT A MEMBRANE KEYPAD! JUST ASK! 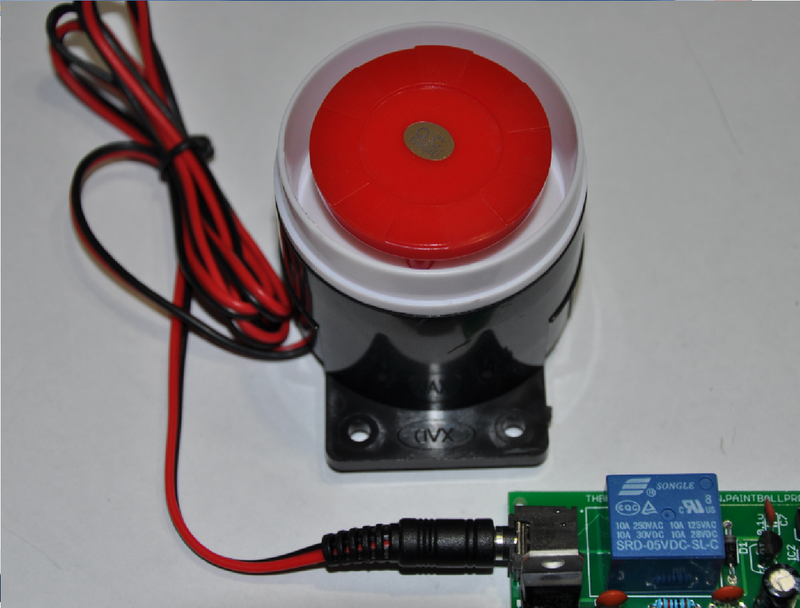 When you first receive your device and you have it mounted in your project box, power it up. When you apply power, the device will introduce itself by saying "Betty". This name was taken from Kung Pow - The Movie. Best movie ever! I Love Master Pain! I digress. The device will then communicate to you several different instructions. The default disarm code is Star, Number, 1, 1. If you do not have all of your wire-cut wires connected properly, then the red LED will light up during power up, and stay on until you do. The combination of Star, Number, 1, 1 will be the default code after every power up, unless you program in your own code. To program in your own special code for the game, power the device down and make sure that you are holding down the "1" button on the board while you re-apply power. Hold this button down until you hear "Enter Program Mode". Let go when you hear that. Then it will be able to enter in a four digit combination. Do so, and it will say "Code Programmed", "System Ready", "Program Wire"... If you don't want to program in a new code for the game, just power the device up as is. When you've entered in a new combination, the green "ACCESS" LED will flash, which indicates that your custom code will be used for that game. If you want to always be programming your own codes for each game, you'll have to make sure that when you power the device on, you are holding down the "1" button. Programmed disarm codes can only be used for one game at a time, and are deleted on power up. When the device prompts the user to "Program Wire", it means that you get to choose which wire will be the deactivation wire. This is fun! If you look at the main board, there are four flying wire sets. Each wire is connected to two pins on an 8-pin header. Of the left hand side, look at the board. You will see that the left most pins are labelled "W1/W2/W3/W4", and that the right pins are simply labelled "COMMON". Each "W" must be connected to any of the pins on the COMMON rail. So W1 must always be connected to the common rail, W2 must be connected to the common rail, etc. When you are prompted to "Program Wire", the green LED will light up. At this point, you can press buttons 1, 2, 3, or 4 on the matrix keypad. Of course, by pressing button#1, you are selecting wire#1 to be your disarm wire. By pressing button#4, you are selecting wire#4 to be your disarm wire. IT IS THAT EASY! 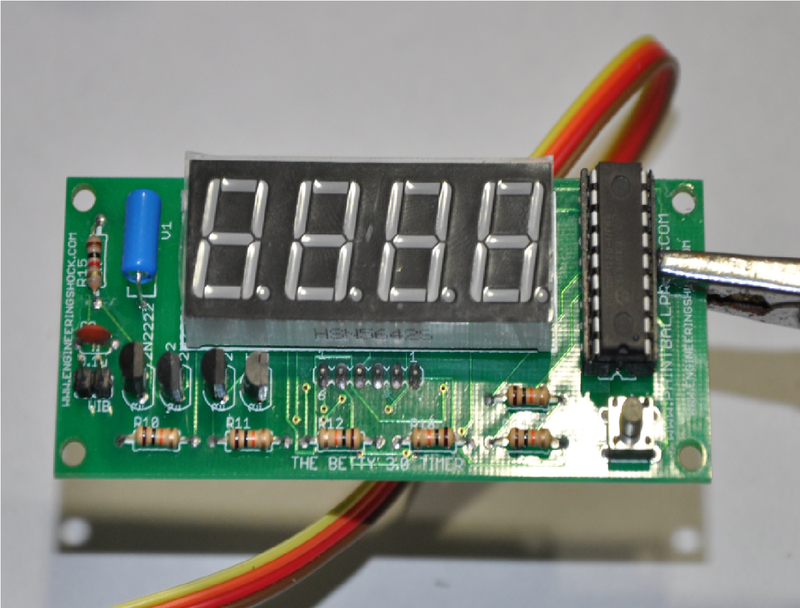 When you power on the Betty, power should also be reaching the countdown timer board. This device can be programmed up to 99 minutes and 59 seconds (9956), so there is a limitation relative to time. Upon power up, the right most digit will show a "0". This is the "Second" digit, and it can be programmed up to a value of "9" by tapping the SELbutton on the countdown timer board. You should only start programming in your game time once the Betty gives you the "Ready Clock" instruction. If the user increments this digit past a value of 9, the digit will reset back to 0. Once you are done programming the "Second" digit, hold the S1 button down for a few seconds, then let go, and the next digit to the left lights up. This is the "10-second" digit, and it can be programmed up to a maximum value of 5. The right most digit and this digit work to program the seconds of the counter up to a maximum value of "59". Once you're done programming the 10-second digit, hold the SEL button down for a few seconds, then let go. The digit that is second from the left will light up. This is your "minute" digit, and it can be programmed up to a maximum value of 9. Once you are done programming this digit, hold the SEL button down again for a few seconds, and then let go. The left-most digit lights up, and this is your "10-minute digit". You can program this up to a value of 9. Once you've programmed in this digit value, press and hold the "1" button one more time, then let go. No digits should be lit up. From here, one quick tap on the 1 button will start the countdown. ONCE YOU HAVE DONE THIS, PRESS THE "1" BUTTON ON THE KEYPAD MATRIX TO START THE GAME! When the device says (System Ready), it will follow with (Enter Combination). From here, the correct combination or the correct wire being cut-removed will deactivate the system. The default code is Star, Number, 1, 1. That will be the default code after every power up, unless you program in your own code. If the clock runs out, the alarm will sound. If you enter in the wrong combination, the system will tell the countdown timer to start counting down 20x times as fast. The main Betty board will say "Incorrect Combination", then "Enter Combination". If you deactivate the system, the device will say "System Deactivated", then the device will reset, and will again say (Betty).